Here’s a look at what comics are coming out from DC Comics for November 2017. The full list of solicitations is available here. 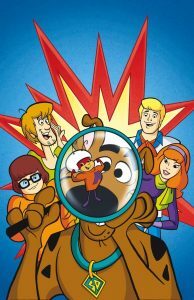 “Scooby-Doo Team-Up” #32. Art by Scott Jeralds. It looks like the Harley Quinn/Poison Ivy/Betty and Veronica crossover might reference Captain Marvel and Wonder Woman? The solicitation mentions a costume party, so presumably other DC heroes (or maybe even Archie’s superhero stable?) will also be referenced. “Future Quest Presents” features the Galaxy Trio this month. They were the co-stars/backup segment on Birdman’s original 60s TV series. This month’s “Scooby-Doo Team-Up” features Atom Ant! It seemed like only a matter of time before we met Hanna-Barbera’s smallest superhero. I assume Shaggy will make at least one picnic reference. 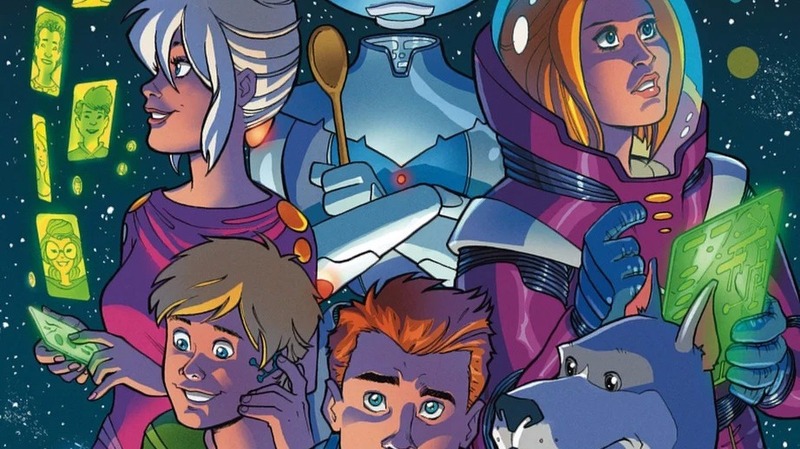 The latest Hanna-Barbera comic is a new series starring the Jetsons. Like the other DC Hanna-Barbera books, this new title features an updated and more serious-toned Jetson family. One big change is that Jane now has a full-time job (besides being a stay-at-home Mom): she’s a NASA scientist. Meanwhile, Rosie A) has downloaded into her George’s mother’s brain and B) has gotten the “New 52 Amanda Waller” treatment and looks quite thin. Until now, the only Jetsons relatives I recall being shown on-screen are Jane’s mother and George’s 110-year-old grandfather, Montague “Grandpa” Jetson. On a related note, the Orbit City crew are (as of this writing) possibly getting a live-action sitcom on ABC, the network that aired the original 1962 series. (Useless trivia: “The Jetsons” is ABC’s first show to air in color.) Hopefully the sitcom’s casting will reflect current demographic trends—the US is projected to become a majority-minority country by mid-century. Thus, even if George, Jane, Elroy, and Judy are cast as all White, their neighbors, coworkers, etc. definitely won’t be.